Paperback, 8.5 x 10.25 in. / 208 pgs / 230 images. Despite the historical significance of form in architecture, the subject is frequently undervalued in debate. 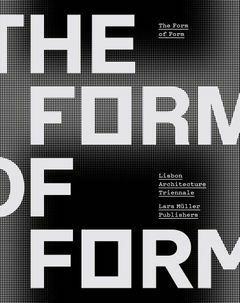 This book relates a variety of ideas regarding form, not only through aesthetic and technological approaches, but also from social and political positions. The contents underline the cultural and technical relevance of architecture to society. The Form of Form condenses the debate occasioned by the 4th Lisbon Architectural Triennale (2016), presenting to a wider international audience the idea that form is an autonomous subject in ongoing architectural debates. It aims to foster new thoughts in architectural approach as we reach the dawn of a rapidly changing society driven by fast access to information. FORMAT: Pbk, 8.5 x 10.25 in. / 208 pgs / 230 images.